Students who wish to teach chemistry in Ohio public high schools can pursue the Bachelor of Science degree in chemistry. Upon completion of this undergraduate degree program in the College of Science and Mathematics, students then need to complete the Professional Educators Program (PEP) Master of Education degree (M.Ed.) through Wright State’s College of Education and Human Services. Graduates of the B.S. in chemistry and the M.Ed. Professional Educators Program are then eligible to seek licensure from the Ohio Department of Education in chemistry or chemistry in combination with another science field depending on the content of the undergraduate curriculum. 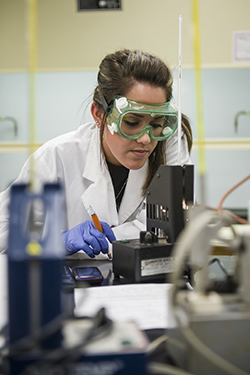 The Adolescence to Young Adult Chemistry Licensure Program is based on an undergraduate Bachelor of Science degree in Chemistry.